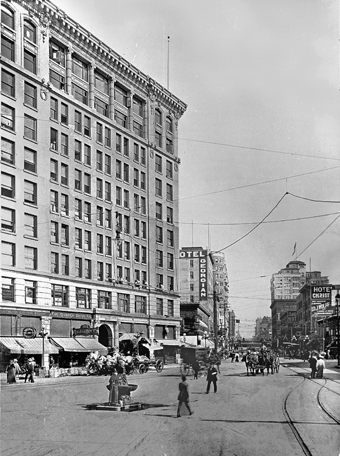 This week’s “now and then” looks across 4th Avenue, east on Pine Street, ca. 1918. A glimpse of the new Frederick and Nelson’s terra-cotta façade gleams at the northeast corner of Pine and 5th Avenue (left of the power pole). I speculate with oft-humbled confidence that here Frederick and Nelson is still being furnished. The neighborhood’s grand new retailer opened on Sept 3rd, 1918. 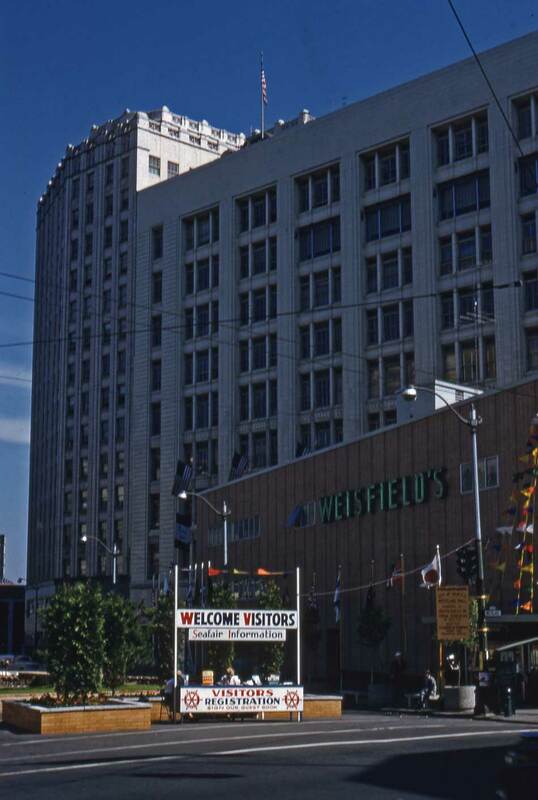 In 1950 four new floors were added to the then 60 year old department store’s first five. With 4% promised from the sign on its roof, upper-left, the directly named Bank for Savings in Seattle is on the left. Across Pine the north façade of the Hotel Georgian leaves no clue here that it is a flatiron building built in 1906 at the Hotel Plaza to fill the pie-shaped block created when Westlake was cut through from 4th and Pike to Denny Way. 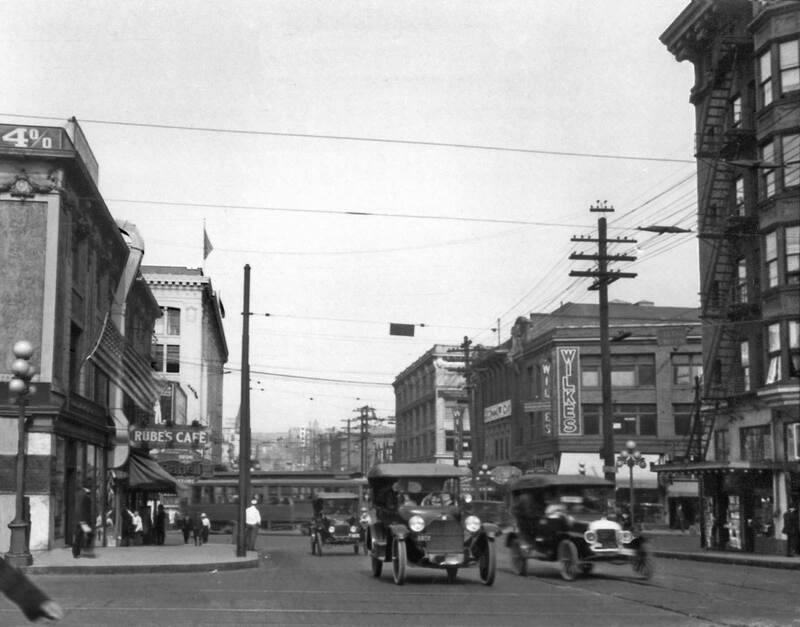 Finally, Fred Cruger, our equally frequent motorcar authority, writes about the cars speeding west on Pine, “Well, I’d bet the one in the background is a Ford, the one closest I believe to be a REO (I was torn between REO and Overland), and the one on the right is a real mystery. Maybe it’s a trick of the lighting that makes the radiator shell look unusually-shaped, but I don’t recognize it. If I absolutely had to take a guess, I’d say ‘Metz’.” Here’s a chance for some Pacific reader to surprise Fred. 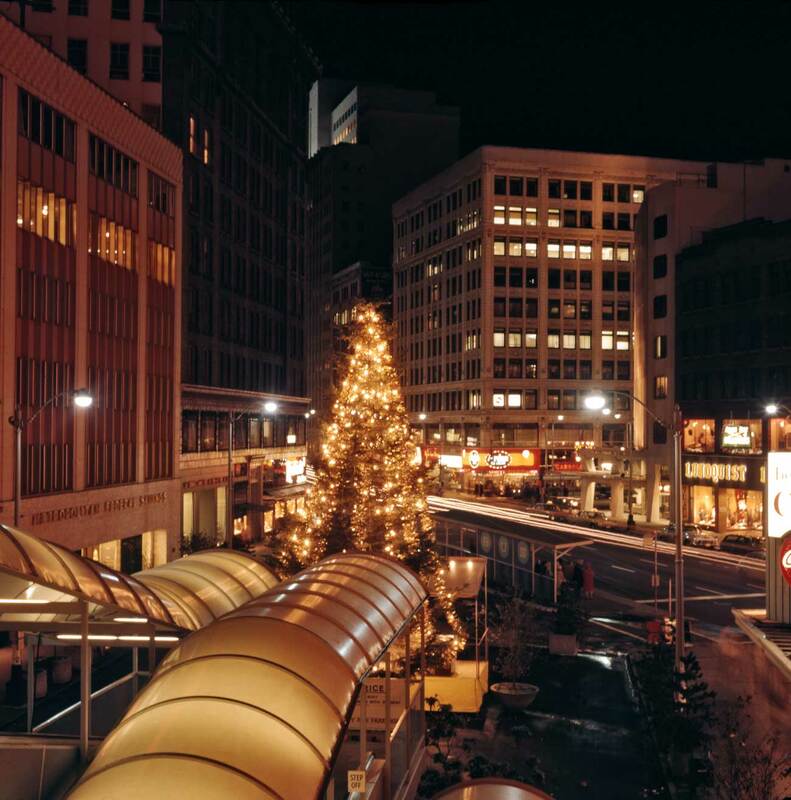 Looking south on Westlake from Pine Street. Note the Chief Seattle drinking fountain (for man and beast) out in the street with little to set it apart or protect it. It was one of three of the same. The entrance to the nearly new monorail. 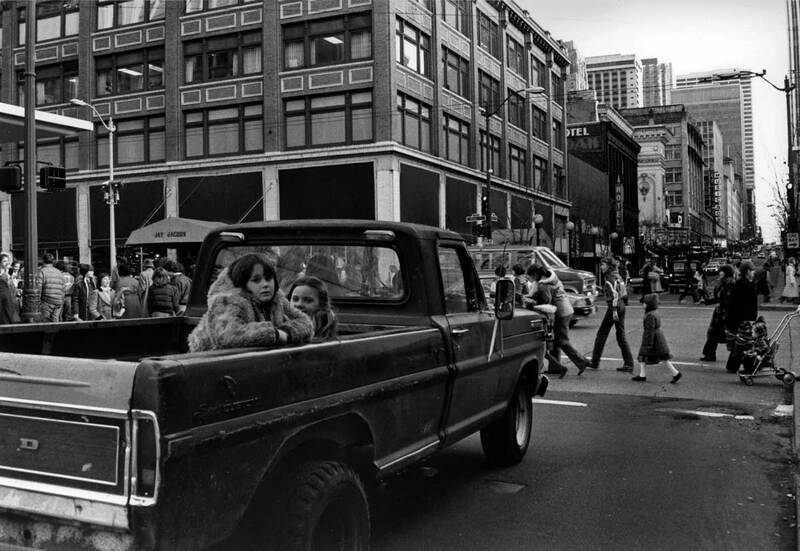 The photographer Frank Shaw looks north with his back nearly at Pike Street. The old flatiron Bartell Drugs is on the left. Date: April 29, 1962. The view looks east from the Bon's parking highrise at 3rd and Pine. Frank Shaw recorded this on March 17, 1962. 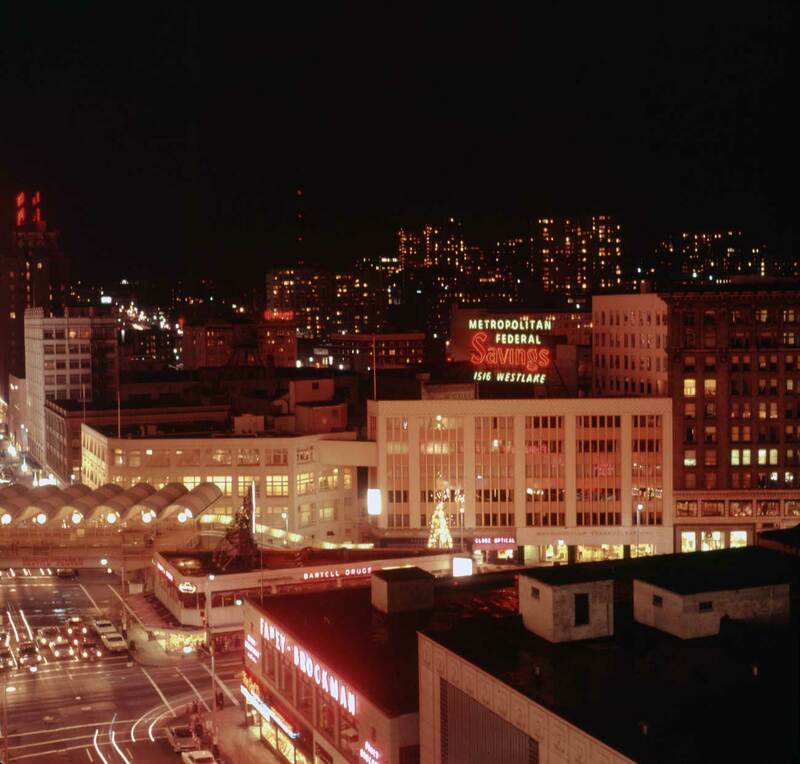 Like the daylighted scene directly above this night view is taken from 3rd and Pine looking east on the latter, and this time also on March 17, 1962. Frank Shaw is, of course, the photographer. 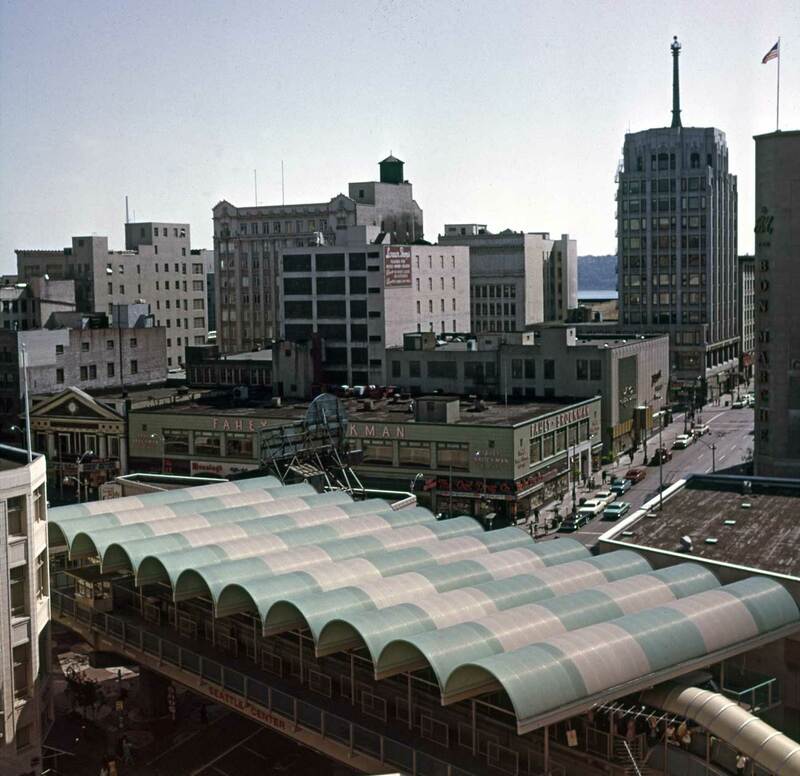 Frank Shaw looks down on the kitschy roof of the Monorail. It was snapped on June 6, 1965. 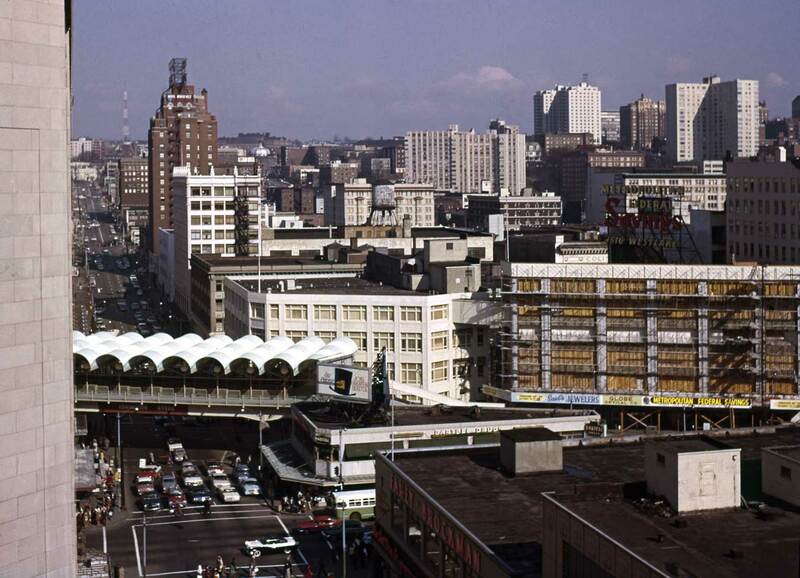 Shaw's mall on Dec. 13, 1966 looking south on Westlake from near Pine. 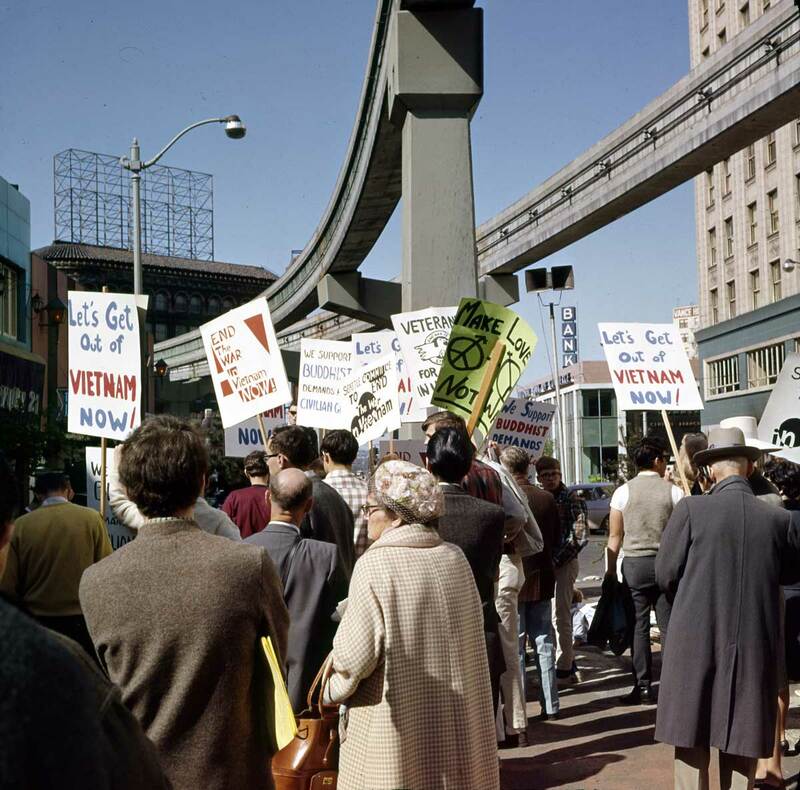 An early anti-Vietnam War protest at Westlake Mall recorded by Frank Shaw on April 16, 1966. A Seafair information booth on the mall. Shaw looks north over Pine between 4th and 5th Avenues. The date:June 28, 1966. Shaw was consistently good about noting the date and more. Not a Frank Shaw photograph - an unidentified one. 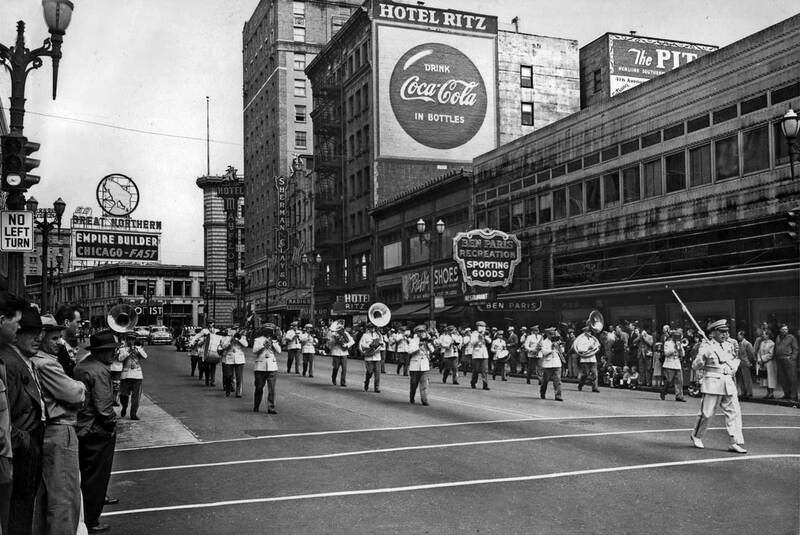 The scene looks north from Pine on 4th on May 30, 1953. It shows the once famous Ben Paris sporting goods store. In the Western World slaying a dragon is a crowning achievement for any hero, and champions have been rescuing damsels from the fiery embrace of these beasts and also carrying away treasures from their fierce protection for a very long time. The crude image of the opium-eating heathen, who worked more for less and then gambled it away, was the stock response to these Asian immigrants. By 1909, it had resulted in more than half a century of terrible treatment. First these “celestials” were used as cheap labor to mine the gold and coal, build the railroads and do domestic service. Then when the work was scarce they were peculiarly taxed and prevented from owning property, gaining citizenship and sending for relatives and wives. 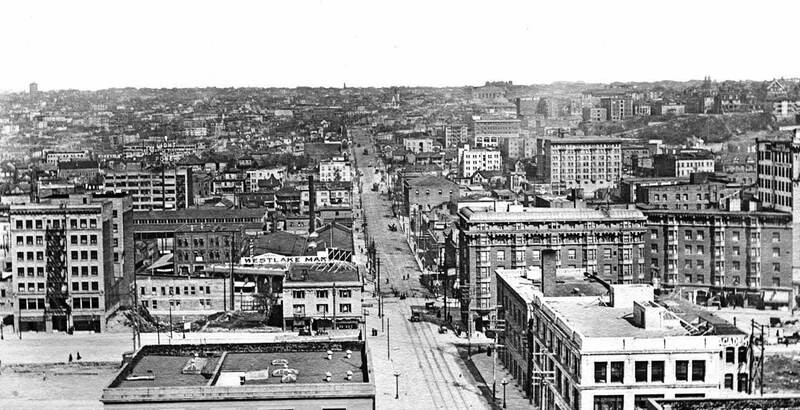 Often they were shipped or railroaded out of town – both Seattle and Tacoma in the mid-1880s – on the very rails they had helped lay. Here, on Fifth Avenue, some of them are back. 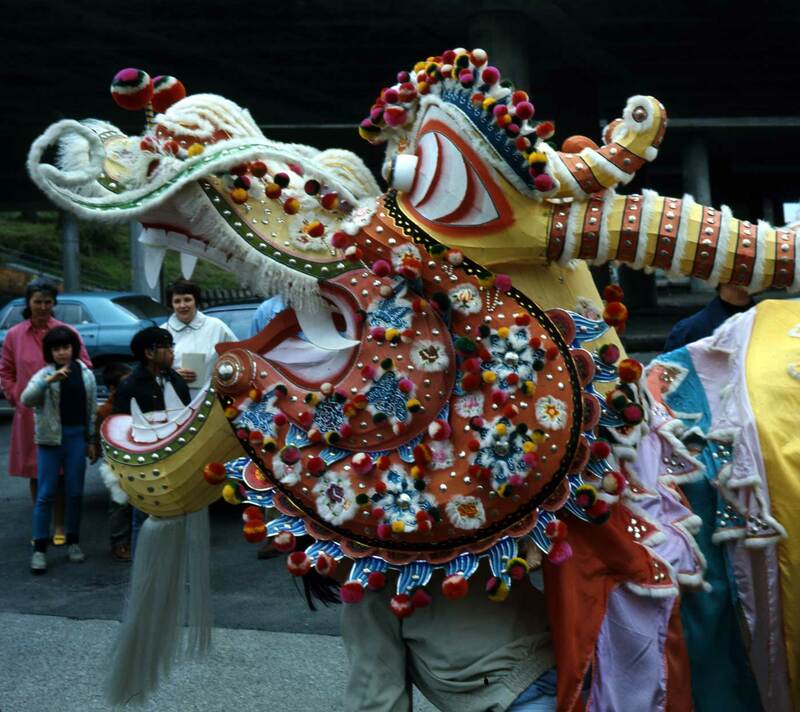 Both their costumes and cutback hairlines are from the Ching Dynasty, which in 1909 was in its 265th year. It would have two years to go. 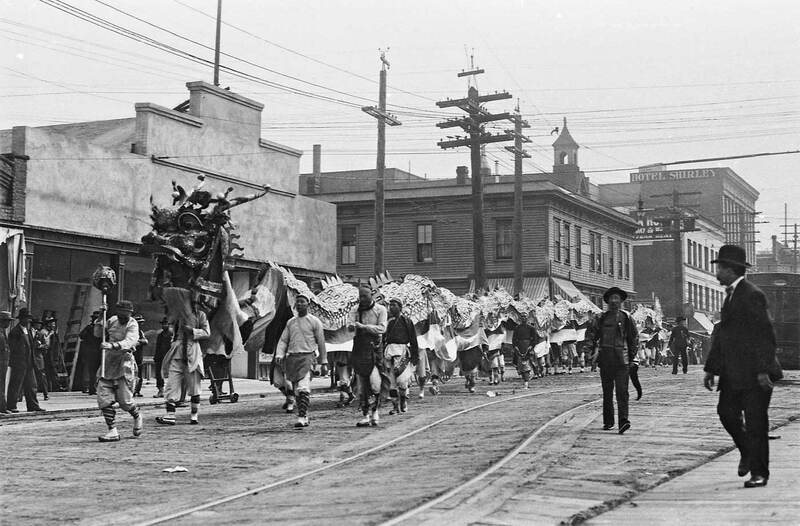 In 1911 demonstrators in the International District would replace the dynasty’s dragon flags with the new republic’s single white star floating on a field of blue and red. This was a design inspired by the Stars and Strips. The contemporary scene is changed in every detail but one. 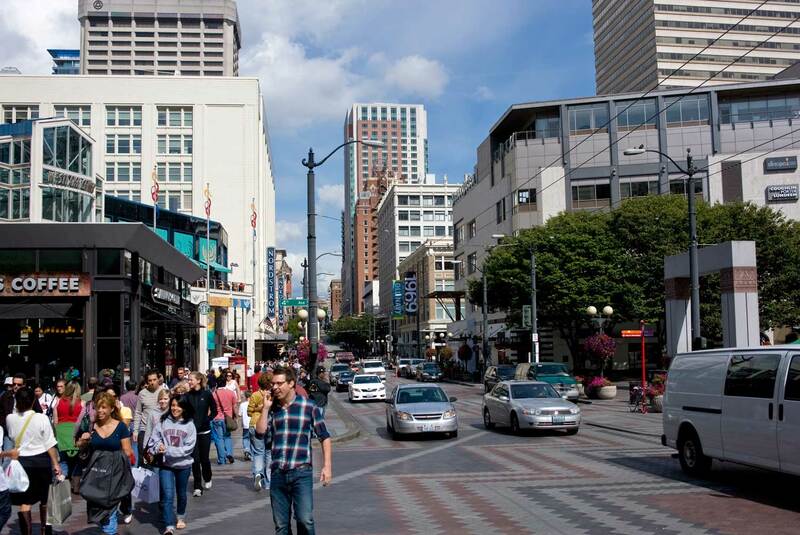 The Westlake Public Market behind the dragon’s head has been replaced by Frederick & Nelsons. (In 1983, yes, but not now in 2010. No no now it is Nordstrom.) Across Pine the Olympic Stables and behind it the Methodist Church have both and long ago also left this corner on 5th Avenue to Jay Jacobs. (But now Jay Jacobs has left it too for Gap.) The survivor: the four-story brick building a half-block south on 5th that is signed the Hotel Shirley in the historical view is now a southern extension of the Banana Republic – I believe. 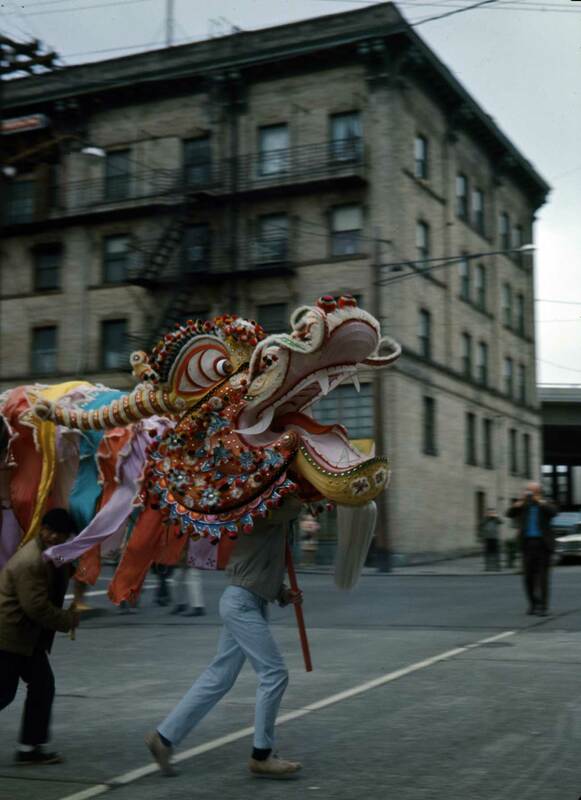 The dragon still dances every Chinese New Year, but not on this part of Fifth Avenue. 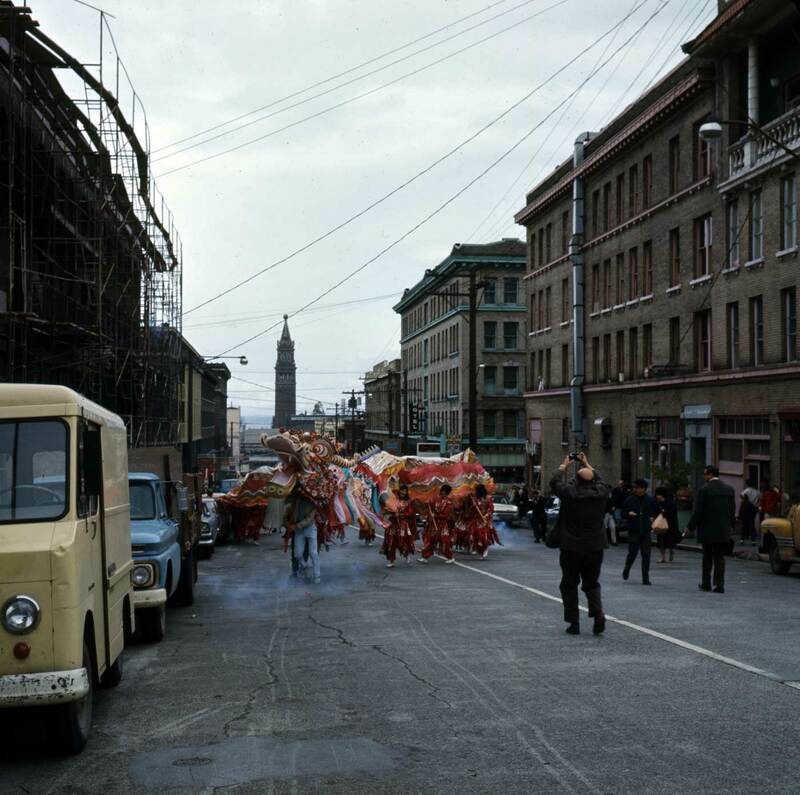 This dragon was captured by Frank Shaw in the International District, or Chinatown, depending. 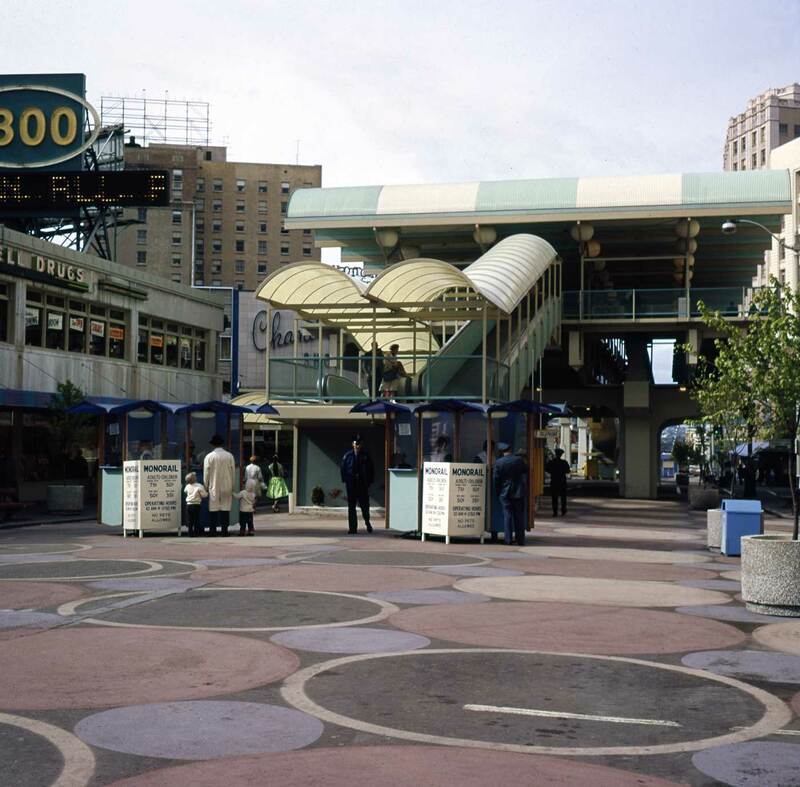 The slides date from April 19, 1966. Temporarily heading east on King Street. Shaw titles this "A Dragon Drop-out." Wandering about Chinatown aka China Town. 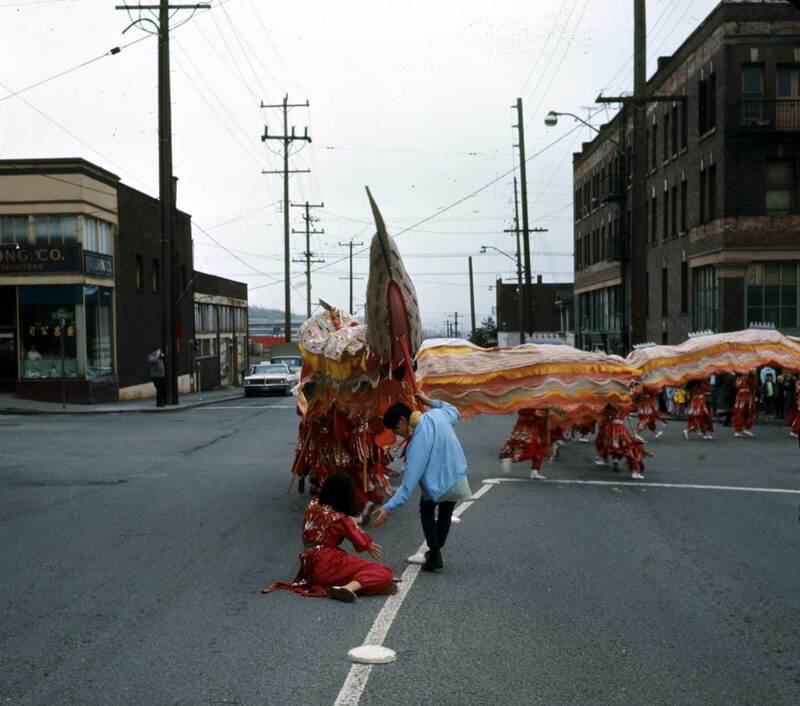 The dragon used on April, 19, 1969 is identified by Frank Shaw as coming from the Thomas Burke Museum on the U.W.Campus. I love all of today’s pictures! 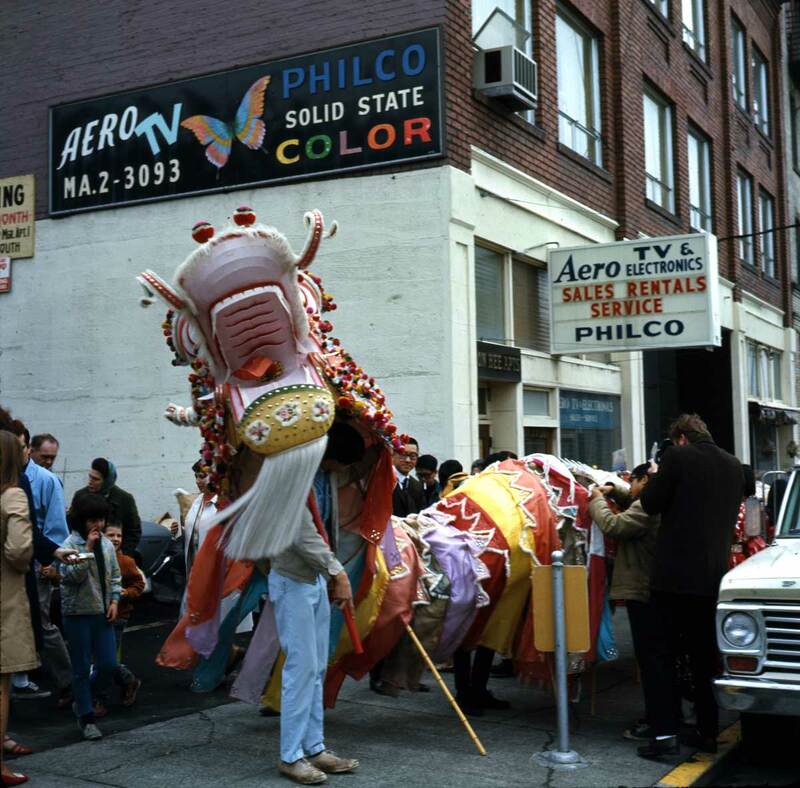 Regarding the Dragon picture on 5th Ave and its 1983 follow up, I’m inclined to think the small building next to (north of) Hotel Shirley also survived to 1983 – and on to today. 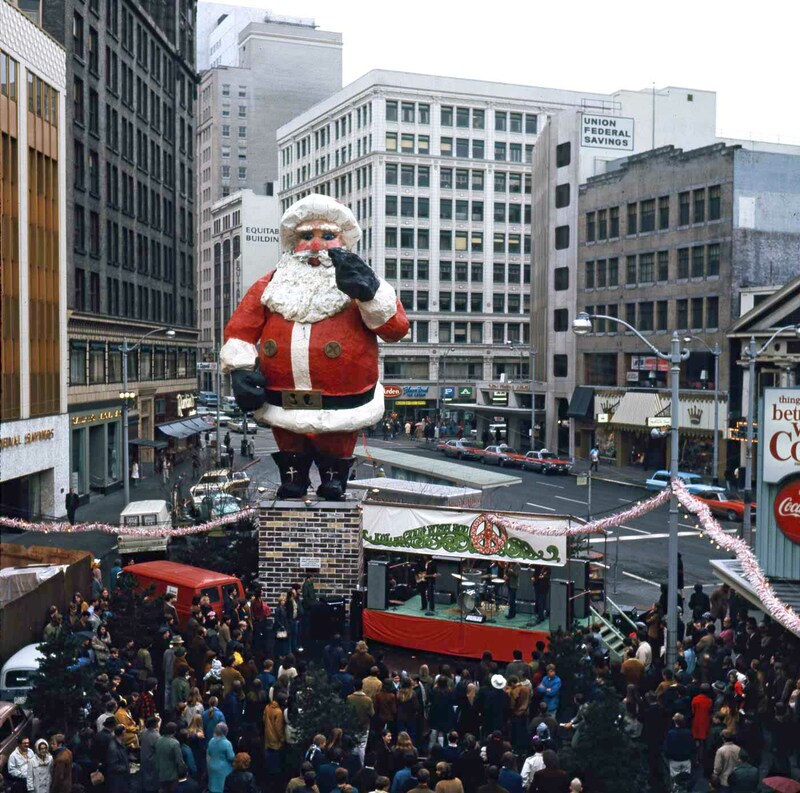 The building, if it is the same, has been drastically altered, but the scale sure seems to be the same. I will keep an eye out Gam. Thanks.